I’m trying to get my ice cream groove going. Christmas is coming and I have a lot of cream to make. But instead of starting with an ice cream concoction, I’ve decided to adapt an interesting recipe that picked up from an old issue of Gourmet. It started as Green Grape Sangria but I figured that it would work well as a frozen dessert. A traditional Spanish libation, sangria is usually a red wine flavored with citrus and apples. Of late, this drink has been unfairly associated with overt sweetness covering over mediocre (often, cheap) wine. But this Gourmet recipe offers something different: a lightness of flavor, a subtle hint of mint and yet, the very distinct characteristic of the white wine still shine though. Frozen, this green grape sangria translates into a flavorfully palate cleanser or even dessert. It is a wonderful sorbet that I cannot wait to share during the holidays. Core, deseed and cut the apples into 1 inch chucks. Remove the grapes from the stems and cut larger grapes into halves. In a medium saucepan, bring the white wine, water and sugar to a boil. Once boiling, add chunks of apples and grapes. Reduce the heat to low. Simmer the apples and grape mixture for about 5 minutes or until the grapes are soft and cooked through. Remove saucepan from the heat and add the mint leaves and crushed vitamin C tablet. Let the mixture steep until it reaches room temperature. Puree the mixture in a blender or food processor and then press the grape/apple puree through a fine mesh strainer. Chill the strained mixture thoroughly in the refrigerator and then freeze it in your ice cream maker according to the manufacturer’s instructions. 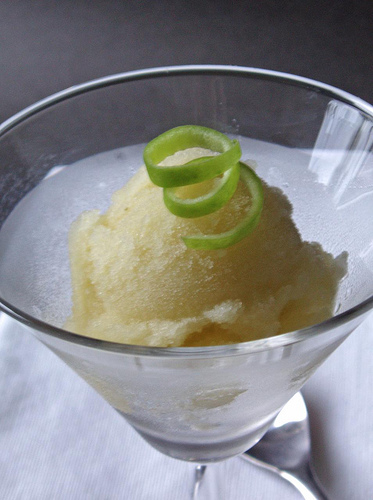 *The vitamin C helps maintain the vibrant green of the sorbet. **I use an Australian Pinot Grigio, but you can use any dry white you enjoy drinking.